Thanks for writing such a detailed blog! It's really helpful. If you don't mind answering a few quick questions...How early did you arrive to search for apartments? And how long did it take before you found one? Thanks! You're welcome -- so good to hear that it's helpful! I arrived in Madrid on Sept. 24 (work started Oct. 1), and found my apartment on Sept. 29, so that's 6 days. I had apartment hunted in Madrid once before (and lived in Madrid for a year prior), so I wasn't as worried. I was also staying with a friend the second time around, and not paying for a hostel, so if I had started work before I had found a permanent place, that would have been okay. In my study abroad program we had two weeks to find an apartment while we lived in dorms. I found my apartment on the 6th day, and everyone found one within two weeks. That's an awesome map, Shaheen! Thanks so much, adding it now! 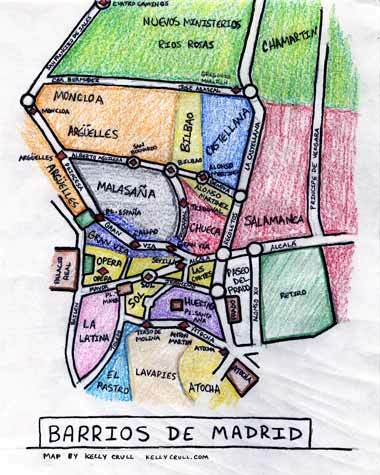 The map is only of the city center (historic area...). There are more neighbourhoods, so I recomend you to visit the websites listed. its been 5 years this article has been written and finding a flatshare still looks scary. who's going to be the genious to come up with the definite website that will help us all, and become a millionaire? It may look scary at first, but it's totally doable! Let me know if you have any questions. Good luck! I'm just seeing this now, but that's super helpful—thanks for sharing the link!